The print edition and the print/e-book bundle of this title are also available separately. The e-book includes the complete text of the print edition in several different file types, readable using a variety of software and devices. You will be able to download the e-book immediately upon purchase; the download link for this product can be found on the final confirmation screen after you complete your purchase, and may also be accessed from your Account History. 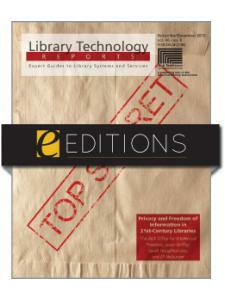 ALA eEditions downloads are designed for single users only. For more information about ALA eEditions file types and how to view them on eReaders, desktop computers, and other devices, see this page. Why Do a Workflow Analysis? Elsa K. Anderson is the Discovery Services Manager at the Icahn School of Medicine at Mount Sinai in New York City. She is responsible for collections budgeting and management, as well as the electronic resources staff and discovery at the library. She has more than ten years of academic library experience in Vermont and New York City. "A good introduction to a complicated but essential aspect of library work. Anderson does an excellent job of explaining the distinct elements that are involved in electronic resource management and the different options available for each of these elements. While the ‘workflow' aspect of this publication takes up only one chapter, it is a crucial element of the ERMS implementation and selection process; this publication is worth reading for this chapter alone."